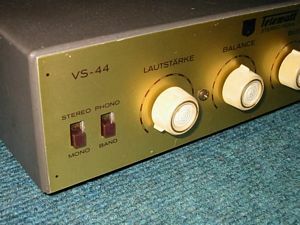 The VS44 is a very nice ECL82 single ended amp which was introduced with a gold/black color front with a red Telewatt logo which was later changed for black / silver design. 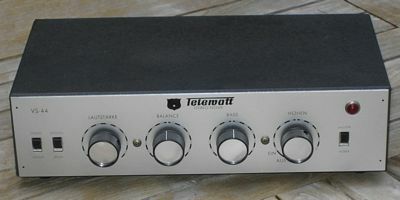 It is rated at 1.5 watts sine wave output (with 1.6% distortion). 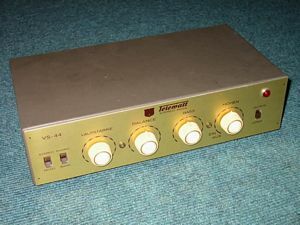 This is the only K+H amp who does not suffer from too many switches and tube stages the signal has to pass. Another very nice feature is the EZ81 tube rectifier and with good ECL82 tubes the amp works pretty good with speakers of higher efficiency. 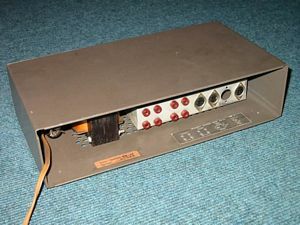 The ECC83 input tube allows to use the triode section of the ECL82 as good working driver. 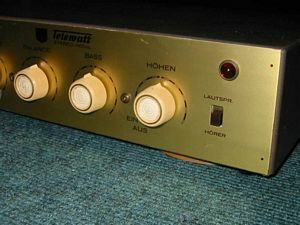 So the amp works (and sounds) much better than other ECL82 single ended amps (as the Telefunken S80 / S81). 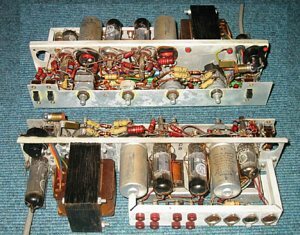 As in many vintage single ended amps hum is a problem in most samples. In the unit I personally use I have installed an additional filter cap in the hole beside the ECC83 tube. Though I use new tubes I only achieve 1 watt of output power, but for my Altec speakers this is enough.